There’s not much going on in downtown Burlington, Vermont. A cool kitchen supply store, a head shop, a few galleries featuring photos of cows, two used bookstores with hefty “farming” sections, and approximately 17 rambling, muttering homeless people. It’s a charming little village. And in the middle of all of this artful noise, The Farmhouse Tap and Grill exists as an homage to one of the things Vermont does best – local food. The local food movement has been growing in popularity over the last few years, but restaurants that place a serious emphasis on local ingredients are still relatively few in number. Truthfully, this can be understandable in many areas of the country, where farming may not be a big part of industry, and local food production may be scarce. But in Vermont, where places like Misty Knoll Poultry and Jasper Hill Farms are right down the road, there is no excuse for local food to be far from your plate at any meal. The Farmhouse doesn’t just have one or two local producers on its menu – chalkboards on the walls proudly showcase lengthy lists of nearby farms. Vermont is known in New England as being one of our most prolific cheese-making states, and The Farmhouse starts off its menu with an award-worthy catalogue of cheeses, along with a local charcuterie lineup. I was particularly excited to see Ascutney Mountain, a raw cow’s milk cheese not always available in Boston, on the list. For lunch, offerings are simple – green salads, a grouping of burgers (beef, turkey, pork, and vegetarian options), or a choice from the “lunch plates” column, with options such as an Egg Salad Sandwich on Cyrus Pringle bread, or Pulled Tarragon Chicken Salad. And, like a lot of places in Vermont, you can get a sunny side up egg on anything (and you should, you really should). 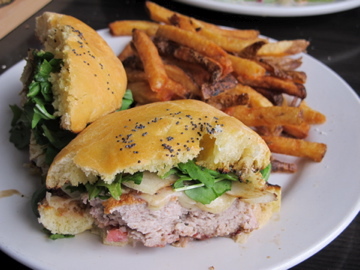 Because of the way The Farmhouse labels itself, I felt it was my duty to order a Misty Knoll Turkey burger and fries, to ensure the gastropub moniker wasn’t being misused. The burger and fries were excellent, served with a row of house-made condiments: barbecue sauce, mustard, garlic aioli, and ketchup. 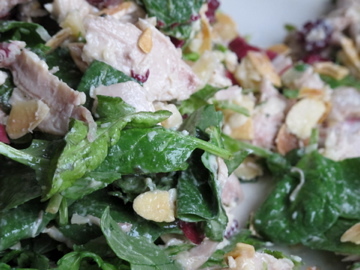 But my dining partner’s Pulled Tarragon Chicken Salad with cider vinaigrette, Cabot Clothbound Cheddar, almonds, and dried cranberries was every bit as good. Three cheers for a restaurant that makes it really tough to choose between a salad and a burger. The Farmhouse is also rightfully proud of its local beer list, rife with selections from Otter Creek, Rock Art, Hill Farmstead, and Magic Hat. They do have plenty of imported selections, but come on, why not drink local too? Though truthfully, I chose a glass of Ciacci Piccololomini d’Aragona (a Super Tuscan red wine, from Italy) to enjoy with my meal, and I have no regrets. The gastropub’s dinner menu is similar to lunch, with “dinner plates” like meatloaf, chicken and biscuits, macaroni and cheese, and mussels. I’d be happy to try any of those options, but we weren’t compelled to order anything from their dessert menu. However, I think we were just full and needed to run the gauntlet of crazy Burlington street people before working up the appetite for Ben and Jerry’s (also local!) down the street. Though once we were outside in the rainy spring weather, we realized it was much more comfortable in the warm glow of Chef Clayton’s farm tabled restaurant. Bottom line: If you are in Vermont, you should be eating local. If you are in Burlington, you should be eating at The Farmhouse.